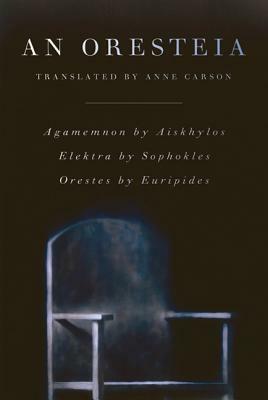 In An Oresteia, the classicist Anne Carson combines three different versions of the tragedy of the house of Atreus — A iskhylos' Agamemnon, Sophokles' Elektra and Euripides' Orestes. After the murder of her daughter Iphigeneia by her husband, Agamemnon, Klytaimestra exacts a mother's revenge, murdering Agamemnon and his mistress, Kassandra. Displeased with Klytaimestra's actions, Apollo calls on her son, Orestes, to avenge his father's death with the help of his sister Elektra. In the end, Orestes is driven mad by the Furies for his bloody betrayal of family. Condemned to death by the people of Argos, he and Elektra must justify their actions — or flout society, justice and the gods. Carson's translation combines contemporary language with the traditional structures and rhetoric of Greek tragedy, opening up this ancient tale of vengeance to a modern audience and revealing the essential wit and morbidity of the original plays. Anne Carson was born in Canada and teaches Ancient Greek for a living. She is currently a professor of classics, comparative literature and English at the University of Michigan, Ann Arbor. Her publications include Eros the Bittersweet (1986), Glass, Irony and God (1995), Autobiography of Red: A Novel in Verse (1998), Economy of the Unlost (1999), The Beauty of the Husband: A Fictional Essay in 29 Tangos (2001), If Not, Winter: Fragments of Sappho (2002), Decreation: Poetry, Essays, Opera (2005) and Grief Lessons: Four Plays by Euripides (2006). Sophocles was an ancient Greek playwright, the writer of Oedipus Rex and Antigone, among other classic works.